When people think of Cascadian football, they think of the MLS rivalries that have existed for decades. Seattle Sounders, Portland Timbers, and of course, your Vancouver Whitecaps are the names that come to mind. 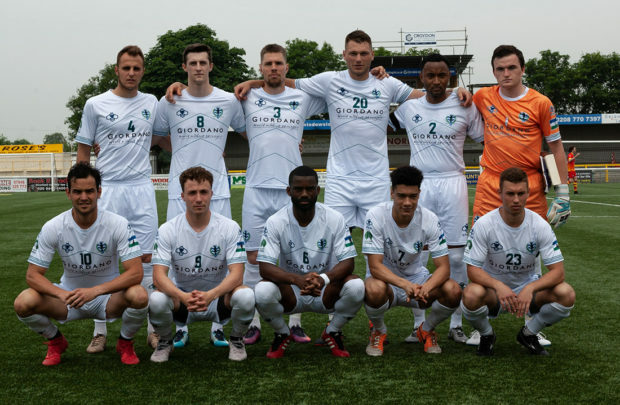 This year, however, Cascadia has stormed onto the international scene and reached the knockout stages in its first ever appearance at the CONIFA World Football Cup. The tournament is a biennial event for the football teams of nations, peoples, and regions not recognized by FIFA. Common entrants include Ellan Vannin (Isle of Man), Panjab (the Punjabi diaspora), Lapland, Kurdistan, and Abkhazia, to name a few. This year, the tournament has a new entry – the Cascadia Soccer Team, composed of players from British Columbia, Washington, and Seattle, as well as those with parental heritage or other ties to the Cascadian area. Notable among them are former MLS Cup champion James Riley. Scottish League Two player Calum Ferguson, Danish 1st Division player Jordan Wilson, and former NCAA National Champion Matthieu Braem. Several members of the team play their club football in the National League in England, or in a number of semi-pro clubs in the Detroit area. It’s certainly a motley crew, but for these players, this is their first chance to play international football, and they won’t want to waste it. Things got off to a rough start for Cascadia, losing 4-1 to Ellan Vannin on the first matchday on May 31st. Ellan Vannin manager Chris Bass was extremely impressed by the Cascadians’ first ever match, saying that they actually looked the better side but were simply unable to convert on chances. The opening loss made their path to the knockout stages incredibly difficult – Ellan Vannin looked likely to take one of the two spots, and with the head-to-head tiebreaker in mind and the -3 goal differential they received from the match, it looked unlikely that Cascadia would be able to find a path to the quarterfinal. But on June 2nd, Cascadia made history by winning their first ever football match, defeating hosts Barawa (the Somali diaspora of England). The match was not without controversy as Barawa chose to field a potentially ineligible player in Mohamed Bettamer. Bettamer was added to the Barawa squad a full two weeks after CONIFA’s May 15th squad submission deadline, immediately becoming their star player. He would go on to score the opening goal in Barawa’s Matchday 2 game against Cascadia, which could very well have eliminated Cascadia from contention were it not for the resilience of the Pacific Northwest side. Cascadia battled back from their 1-0 deficit to take the lead before the first-half whistle on goals from Josh Doughty and Hector Morales. Both goals were facilitated by the relentless pressure of Calum Ferguson and Max Oldham, who terrorized the weak and disorganised Barawa defence and created space for Doughty and Morales to knock home their goals. In the second half, it was all hands on deck as the Cascadians fought tooth and nail to hold on to their one-goal lead and secure their first 3 points of the team’s existence against the hosts. The reaction afterwards was relief, and a cautious optimism – the defeat of Barawa gave Cascadia the chance to make it through to the knockout round. Despite securing a win on the second matchday, the Cascadians still had a steep hill to climb. They would be guaranteed qualification with a win over Tamil Eelam (an unrecognized nation-state of the Tamil people in Sri Lanka) and a Barawan loss to Ellan Vannin. If the Somalis won however, Cascadia would need a six goal margin of victory to surpass Ellan Vannin and secure second in the group. With the matches being played simultaneously to ensure a lack of collusion, the Cascadians had to play for the worst case scenario, meaning they had to go out and score six goals in 90 minutes while conceding none. It was quite a daunting task, but the Cascadians rose to the occasion magnificently. Brothers Patrick Wilson (centre half) and Jordan Wilson (holding midfielder) handled the defensive side of things quite well, as the Tamil attack looked quite dangerous going forward but was stifled every time by either the fraternal pair or goalkeeper Will Marment during a particularly exciting flurry of Tamil attack. The Cascadians were able to shut the door, while opening another as they scored the first goal of the match on a Jon Nouble penalty, which he won himself and converted with ease. Winger Max Oldham continued to rip into defences and with Calum Ferguson resting on the bench after 180 gruelling minutes in the previous two games, the onus was on him to provide the offensive spark. He did just that, serving a beautiful ball to Tayshan Hayden-Smith who volleyed it home to double Cascadia’s lead with 12 minutes to play in the opening half. During the halftime team talk, the Cascadians received word that Barawa was leading Ellan Vannin by a goal to nil, and Cascadia shifted into overdrive. But with just over half an hour left to play, the score remained 2-0, and Ferguson was summoned off the bench to turn the fortunes. Instead it was Yuri Farkas who got things going, scoring a pair of goals in 2 minutes to raise Cascadian hopes. With 15 minutes to play, Matt Braem was sent off and those hopes seemed to have been dashed quite expertly, but a Nouble screamer from the edge of the box gave Cascadia a chance at getting through with just over three minutes remaining in regulation time. In the 89th minute, a beautiful through ball found its way onto the feet of none other than Ferguson who slotted home the sixth and sent Cascadia to the group stages in the most thrilling manner possible. Today, the Cascadians take on Karpatalya, the Hungarian diaspora in Ukraine, for the chance to go through to the semi-finals of the CONIFA World Cup in their first ever tournament as a team. It will be difficult, but as we’ve seen so far in the tournament, it has the potential to be an incredibly thrilling match. It isn’t quite like watching Brazil, but with the FIFA World Cup around the corner, it ticks all the boxes – international football, grassroots, and a team representing our beautiful chunk of the Northwest. Kickoff is at 10 AM Pacific time, and the match can be streamed for free on Cascadia Football’s website at cascadiafootball.org.